Inspired by the famed Maserati 450S, our unique hand-built bespoke car is made of welded and hammered aluminum. Wil de Groot designed and created the roadster starting by forming a scaled clay model, followed by building a wooden buck. The metal work utilized an English wheel, traditional panel hammering and beating methodology and aluminum gas welding. This blog details the design, fabricating, engineering, engine work, upholstery, paint and bodywork which was performed in-house at Exoticars USA. We are skilled and equipped to tackle any creative custom job you have in mind. Midway through our custom scratch built roadster construction we bought our first Ferrari, a 1978 308GTB. The Ferrari was a shop project car: we heavily modified the 308 to increase performance at the track and on the road. This 2 year project was a labor of love including a machined billet aluminum intake manifold/plenum with 4 Laminova air-to-water intercooler cartridges and Opcon supercharger. The engine was refreshed with new bearings, seals, gaskets, belts, etc. We resurfaced the valves and seats. We powder coated the cam covers, belt covers and oil tank. The Ferrari was set up with an Electromotive TEC3 ECU, distributor-less ignition and EFI. Additional modifications include twin Ford throttle bodies and air filter elements in aluminum boxes ducted to OEM air intakes in the body side. Twin Bosch fuel pumps. Setrab (oil-to-water) oil cooler. Meziere electric engine coolant pump. Evan’s waterless coolant. Modified Griffon, Ford type, NASCAR type aluminum radiator. Coolant recovery tank. Meziere electric coolant pump for twin intercooler heat exchangers. Electric AC compressor (yes, an improvement over the stock Ferrari configuration). Ford high out-put alternator. JetHot coated exhaust headers. Custom fabricated stainless steel exhaust system with Magnaflow mufflers. Kevlar clutch. Porsche-996 Turbo/(Brembo) calipers and 12″ rotors. Custom machined billet aluminum parking brake calipers. Tandem Tilton brake master cylinders with cockpit adjustable bias. Custom made 17″Kinesis modular wheels with 5 spoke centers. Dunlop Direzza tires (225/45ZA17 front, 255/40ZR17 rear). Lightened and strengthened OEM control arms. Urethane bushings. Hyperco racing springs. VariShock adjustable aluminum coil-over shock absorbers. Heavy duty sway bars. Custom fabricated aluminum and stainless steel mesh grill. Simpson 5-point safety harnesses with original three point belts in place. On board fire system. Aluminum pedal pads. Re-covered dash. Special MOMO steering wheel. Composite rear bumper. Set up for “heel and toe”. Body, chassis, interior were virtually unchanged – new owner has the option of returning car to stock configuration. We would have loved receiving the assignment to build this Ferrari custom aluminum bodied Testa Rossa from scratch, but we didn’t. It’s too bad because we would have done a better job! Instead we received the car for service because the engine was making a metallic noise and it ran on no more than 6 of its 12 cylinders. We fixed all that but found problems with the suspension, the steering, the cooling system, the ignition system, the throttle linkages, the electrical system, body to chassis alignment, the paint, the wheels and tires, etc, etc.This car needed major sorting and re-engineering. It now runs and drives beautifully. 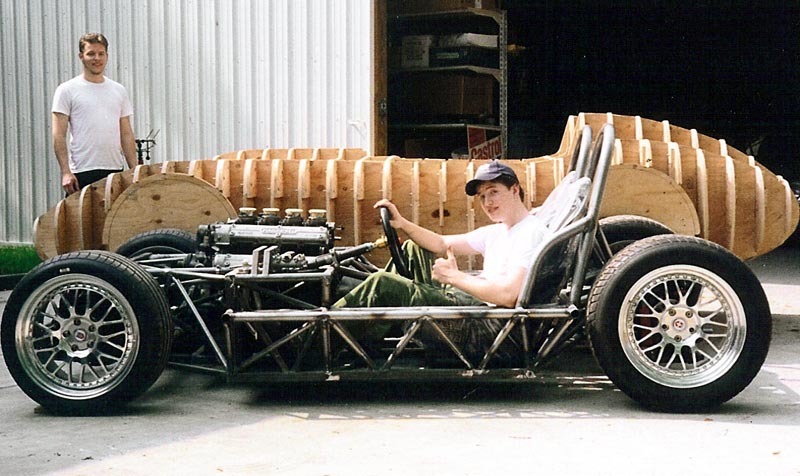 When first built she apparently had a vintage Ferrari V12 engine but that was replaced with a Jaguar V12 equipped with Electromotive computer controlled fuel injection and distributorless ignition and TWM throttle bodies, before we received the car, in an attempt to make the car more user friendly. Unfortunately none of this equipment had been set up properly, which is why it wasn’t running right (I imagine the carburetors and distributors on the original Ferrari engine weren’t set up correctly either). The metallic noise had made us wonder if the engine had a loose valve seat, or something like that, but after removing a cylinder head the cause turned out to be a piece of copper wire lying on top of a piston and making contact with the head. Not having air filters, the engine apparently just sucked the copper wire in. Luckily it didn’t do any serious damage. I had the pleasure of seeing this car being built from the mock-up to the end. It is a work of art! Thanks Bruce, for the compliment and the help and the friendship. All are greatly appreciated!